For this Yankee (or as they say in the South - Damn Yankee), the start of the college football season in Athens, Georgia never really feels like football season. Until recently, the early games at Sanford Stadium were against no-name teams and started at 1:00 in the afternoon, in 95 degree temperatures, and no shade. It was a far cry from youthful September afternoons going to games at at Michie Stadium at West Point, Andy Kerr Stadium at Colgate University in Hamilton, New York, or the old Taylor Stadium at Lehigh University in Bethlehem, Pennsylvania. Nothing said football like a crisp autumn chill in in the air and the beauty of the changing leaves. As I would sit in stands for these University of Georgia games (the only games one could easily get cheap tickets from scalpers), I would wonder why they would not play these games at night. The weather would be cooler and people might not leave the games as early as they did to get out of the heat. After all, fellow-Southeastern Conference (SEC) school LSU is known for their night games and the atmosphere around the games. Fifteen years later, things have changed and it is driven by the new ESPN and CBS Sports television contract with the SEC. How much of a change? This will be the first time in the modern lighting era at UGA that four of their home games will be played at night, and the most since the five played in 1943. Alabama loss on September 27, 2008. You have to go back to the 1940's for that tally because the stadium lights, which came out from the famous English Boxwood Hedges at the time, were installed at field level in 1940, and removed in 1964. According to one native Athenian I talked to, the reason they were taken out was so that the field would no longer be used by Clarke Central High School for their Friday night games. Now with the new TV contract, times and things have changed. 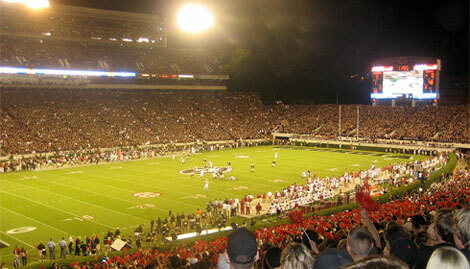 When the current lights were installed in 1982, a rule was put in place that UGA would only play one night game a year. This rule was later changed to two night games a year. In addition, legendary UGA Coach and Athletic Director Vince Dooley had a rule that no night game could be started after 7:05 PM or so. And it is fitting how this ties into ESPN's selection of the Auburn - UGA game this week and the Kentucky - UGA game next week. In 1995, ESPN wanted to start the Auburn - UGA game at 7:30 PM or so. Dooley put his foot down and said absolutely not. So the game time was set to about one minute before Dooley's line in the sand, and the game went on the air. This week's game will start at 7:00 PM, which would easily fit into Dooley's old rule. But now the SEC Contract with the networks rules, so next week's game will start at 7:45 PM. Dooley's successor as Athletic Director, Damon Evans, does not have they say that Dooley did at the time. Right now the line in the sand for Evansa is that there will be no Thursday night games in Athens. So how does this tie into next week's home game against Kentucky? If you go back to 1940, the first night game at Sanford Stadium, played on October 26, 1940, was against Kentucky. The end result was a 7-7 tie, a result Georgia cannot have this year to keep their bowl hopes alive if they do not beat Auburn on Saturday.